A serious breach of rights was revealed on Tuesady, at a hearing at the Petah Tikva Magistrate's Court on the case of several of the Jewish youths being held on vague suspicions of involvement in the lethal Duma arson in July. During the discussion, it became clear that Israel Security Agency (ISA) investigators did not allow the detained suspects to put on tefillin (phylacteries) or light Hanukkah candles, in a blatant denial of their religious rights. 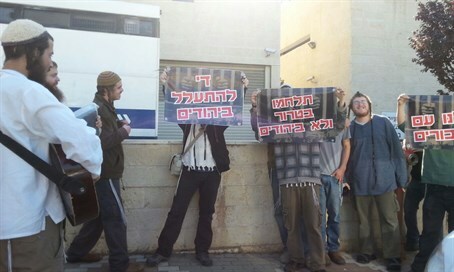 Outside the courtroom, dozens of friends of the detainees protested, bearing signs with words such as "stop abusing Jews," and "fight terror not Jews." The frustration is particularly high given that Internal Security Minister Gilad Erdan (Likud) last Friday admitted there is no evidence to try the suspects; the suspects have been denied from meeting their attorneys, and several allegedly are being denied medical attention after being beaten during their arrest. Attorneys Bentzi Kavler and Chai Haber, who are representing a portion of the detainees for the Honenu legal aid organization, demanded that the suspects be granted their basic religious rights to don tefillin and light the holiday candles. Just on Monday Attorney Adi Keidar of Honenu asked the investigative authorities to allow the suspects to light Hanukkah candles, but on Tuesday it became clear the request had been ignored and their rights had been trampled. "We understand that the detainees were denied not only medical treatment but that there is also a wide deprivation of rights, both in the form of the management of the investigation, and in not allowing the practice of the mitzvot (religious commandments)," said Attorney Haber. "We hope that someone will put an end to this." "Are they even connected to the case?" Attorney Kavler expressed his protest to the abuse of his client, and the serious infringement of his rights. "My feeling is growing stronger that the suspicions ascribed to my client are not connected to reality," said Kavler. "His connection to this incident is hazy and completely detached, if any connection exists at all." "There is no development in the investigation as far as we see, and I hope that he will be released quickly. The harm to his rights as someone under investigation, as well as to his religious rights, is extremely severe." Regarding the deprivation of rights, the US Consulate to Jerusalem last week promised to get involved to defend the rights of one of the suspects who is an American citizen, after his parents wrote to the Consulate complaining that he is being held in an unknown location, and that his medical condition is deteriorating in investigation. They revealed their son suffers from several allergies as well as attention deficit disorder and needs medication, to which the Consulate said it would try to speak to the Israeli authorities about the matter. A litany of harsh treatment has been testified against the ISA, with witnesses reporting agents brutally beat the suspects during their arrest and hid video evidence of the assault. Attorney Itamar Ben-Gvir represents one of the suspects whose wife testified he was beaten during arrest, and who was not brought to the court last week in a worrying sign that his medical condition is being covered up. On Sunday Ben-Gvir noted how Arab terrorists were allowed to see their lawyers the day after murdering a Jew, arguing that terrorists are given better treatment than Jews. The lawyer also slammed “the conduct of some of the judges who give the Shabak (ISA) too much 'credit' for it supposed 'secret information' about alleged security incidents,” which more often than not does not pan out.